Adaora Ogbaru is a middle-aged woman, married with three children. She has never had any health complications since she survived a surgery from fibroid. Suddenly, Ada as she is fondly known among acquaintances began to show signs of cough and wheezing. Her problem became worsened after what she thought was simple symptoms of cough was diagnosed as Tuberculosis (TB). However, the hospital authorities could not admit her to receive the treatment as there was no bed space. She was placed on the first-line drugs to treat the disease for eight months even as health workers were assigned to administer the drugs on her at home. Ada defaulted from going through the treatment. She preferred to go behind the doors taking traditional medicines. According to her, she did not want people to know that she had TB. Her case further got more complicated after she was back to the hospital and was diagnosed of multi-drug resistant (MDR-TB). Ada is simply an example of thousands of Nigerians with MDR-TB. The bacteria that cause TB can develop resistance to drugs used to cure the disease. Multi-drug resistant TB fails to respond to at least isoniazid and rifampicin, the two most powerful anti-TB drugs, according to the World Health Organization (WHO). The WHO said in 2014, multidrug-resistant TB was at “crisis levels”, with about 480,000 new cases in 2013. It is a manmade problem caused by regular TB patients given the wrong medicines or doses, or failing to complete their treatment, which is highly toxic and can take up two years. Although all forms of TB are highly contagious, drug-resistant TB can be particularly challenging to control due to the longer treatment period and more costly drug regimes. Over the next 35 years, multi-drug resistant tuberculosis will kill 75 million people and could cost the global economy a cumulative $16.7 trillion (£15 trillion) – the equivalent of the European Union’s annual output, a UK parliamentary group said recently. If left untackled, the spread of drug-resistant TB superbugs threatens to shrink the world economy by 0.63 percent annually, the UK All Party Parliamentary Group on Global Tuberculosis (APPG TB) said, urging governments to do more to improve research and cooperation. “The rising global burden of multidrug-resistant TB and other drug-resistant infections will come at a human and economic cost which the global community simply cannot afford to ignore”, economist Jim O’Neill said in a statement, recently. The prevalence of MDR-TB emerged several years ago in Nigeria and most of sub-Saharan Africa where weak health systems exist. In these countries, diagnostic facilities and drug treatment of MDR-TB are largely unavailable. Even in countries, where treatment is available, the treatment outcome has been poor. A prevalence survey by the Federal Ministry of Health in 2012 showed a doubling of the estimated overall prevalence of TB (the total number of people with TB) and a tripling of the estimated incidence (the total number of new cases), compared to previous estimates by the world health body. 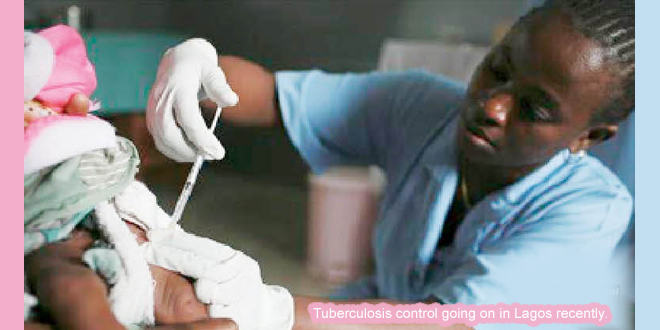 In 2013, Nigeria diagnosed and reported 16 per cent of the estimated TB cases. In 2010, more than 7, 000 cases were reported with MDR-TB and nearly 17 per cent of TB burden were MDR-TB patients among newly infected and re-treated TB patients. Nigeria started MDR-TB treatment in 2010 after a successful pilot in drug resistant TB treatment centre at the University College Hospital (UCH) Ibadan, Oyo State. A year later, MDR-TB treatment was scaled up nationwide. With increasing TB diagnosis, a growing pool of MDR-TB patients has emerged within the country. Current estimates by the WHO reveal there are at least 8,000 cases of MDR-TB in Nigeria, which, incidentally, has the third highest TB burden in the world. The WHO estimates that the prevalence of MDR-TB in Nigeria is about 1.7 percent among new TB cases and 7.9 percent among retreatment cases. Despite this high prevalence, facilities for diagnosis of MDR-TB are sparse and treatment largely unavailable. Researchers at the Nigerian Institute of Medical Researcher, NIMR, who spoke in Lagos, are worried that Nigeria remains among 11 high TB burden countries that contribute 15 per cent of the three million missed cases of TB, globally. Decrying that it is unacceptable that Nigeria ranks third among the 11 countries, they said despite control efforts by the Federal Government, Nigeria does not meet any of the Millennium Development Goals, MDG, 3 targets in reducing TB incidence, prevalence and mortality rates. Dr. Oliver Ezechi, the Deputy Director Research & Consultant Obstetric gyneacologist, NIMR, who confirmed this, said that MDR-TB is one of the worst public health threats we are facing and we must ensure that we find, diagnose and treat cases as soon as possible, to avoid the spread. The fight against TB, the world’s second deadliest infectious disease after HIV, is also hampered by a lack of an effective vaccine, Ezechi lamented. The only TB vaccine, BCG, protects some children from severe forms of TB – including one that affects the brain – but is unreliable in preventing TB in the lung, which is the most common form of the disease, he added. Dr. Dan Onwujekwe, Chief Researcher, Clinical Division, NIMR, said: “We have a new challenge in MDR, because the number of people with multi-drug resistant Tuberculosis is increasing, even as treatment for the disease is costly. Commenting on how TB cases spreads and progresses to MDR like in Ada’s case, Onwujekwe said: “We are supposed keep TB patients in isolation in the hospital where we administer the first-line treatment for eight months and if successful, the treatment is continued for another one year at home. However, there are not enough facilities, bed, so we treat them at home. The Director- General, NIMR, Prof. Emmanuel Ujah, said the death toll from the disease is still unacceptably high and efforts to combat it must be accelerated if the global targets, set within the context of the MDGs, are to be met. Ujah who enumerated the ongoing strategies in conducting research on TB, said 2015 marks a transition from MDGs to post – 2015 development frame, adding that within the context, the WHO has developed a post – 2015 global TB strategy called “the End TB Strategy”. The goal of the strategy is to end the global TB epidemic by 2035 with targets of 95 percent reduction in TB deaths and 90 per cent reduction in TB incidence. The strategy also targets a zero catastrophic costs for TB affected families by 2020. TB, which spreads through the coughs and sneezes of an infected person, kills 1.5 million people worldwide yearly, according to the WHO. This story was published in Newswatch Times on August 26, 2015.